Attracting great talent to an accelerator that doesn’t have the name Techstars or YCombinator in it can be a difficult task. Attracting great talent that’s already had success in the startup space can be even more daunting. That’s what happened in the case of Indiana startup Boosterville. I actually met Pam Cooper the CEO and co-founder of Boosterville, while it was still called Sodbuster, on Brad Feld’s Hacker News alternative site, the startup hub. Pam and I quickly became friends. It was then I learned that she was a little more “seasoned” than other founders, having started a very successful small business in Indiana. Her quick wit and thought provoking questions made it easy to interact with her on an online platform. Pam decided that despite a failed attempt at Indianapolis startup conference “Powder Keg” her and her co-founder/CTO husband, Tom Cooper, would make the trek to Memphis for everywhereelse.co The Startup Conference. At the same time we were accepting applications for Seed Hatchery and I quickly introduced her to the organizations leader, Eric Mathews, and they got in. We learned through the vetting process that Tom was actually the founding CTO of question and answer site Cha-Cha. He also has a long resume of engineering work at several successful startups and companies. The Cooper’s have done well. They’ve got kids in college, a rather large home in Indiana, oh and Tom has his own plane as well. So why come all the way to Memphis for an accelerator?Great question, the answer: For the accelerator. From day one both Pam and Tom dove head first into the curriculum, learning, sharing and development that is offered through the Seed Hatchery program. They took criticism like the best of them, often times from leaders and mentors that didn’t have even a fraction of the startup experience that Tom had. Both Cooper’s have said over and over again how much they’ve learned here in Memphis. “I really didn’t know what to expect, so we went for it and Seed Hatchery was the best thing we’ve done for our company” Tom told us in an interview. During the accelerator the coopers went through a name change, a huge pivot and even worked hand in hand with MBA students for discovery, and to help refine their product. Boosterville combines digital wallet with loyalty and rewards and all for the benefit of schools and non profits. Using Dwolla, another midwest startup, as their mobile wallet conduit, users sign up for a school they want to donate to. From there they can see a list of merchants in their community that use the Boosterville platform. When they make a purchase at one of the establishments in the program, they check out using their phone, the merchant gets paid, the school gets a donation and Boosterville takes a small cut. “Putting children who are now grown, through school I’ve seen my share of wrapping paper and World’s Finest Chocolate Bars”, Pam loves to tell anyone who will listen. Of course we all agree. The company is a great mesh of Pam’s community minded nature and business savvy, with Tom’s over three decades of programming experience. 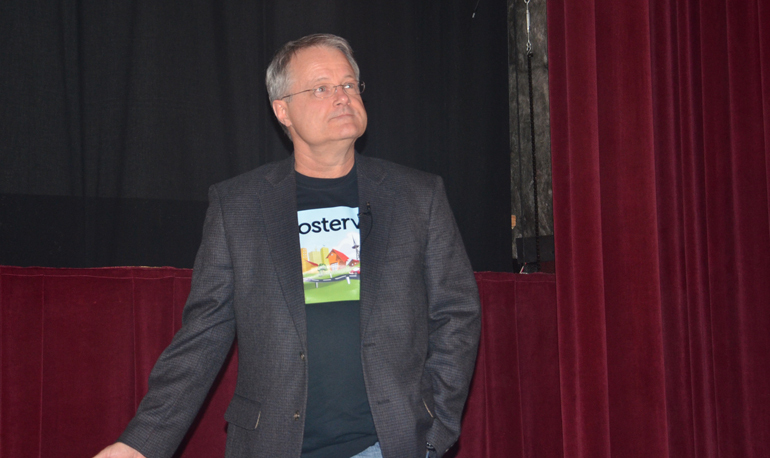 What’s next for Boosterville, well while Tom has an open invitation to return full time to his engineering job in Indiana, they are going to continue to raise money and bring Boosterville to live. We’ve got more Seed Hatchery coverage here.